2 cavities where an atomic force microscope (AFM) tip was used to apply a stress to the sheet to test its mechanical properties. Its spring constant was in the range 1–5��N/m and the stiffness was 7011500000000000000♠0.5 TPa, which differs from that of bulk graphite. These intrinsic properties could lead to applications such as NEMS as pressure sensors and resonators. 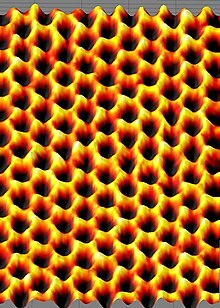 Due to its large surface energy and out of plane ductility, flat graphene sheets are unstable with respect to scrolling, i.e. bending into a cylindrical shape, which is its lower-energy state. ^ Lee, C.; Wei, X.; Kysar, J. W.; Hone, J. (2008-07-18). "Measurement of the Elastic Properties and Intrinsic Strength of Monolayer Graphene". Science. 321 (5887): 385–388. doi:10.1126/science.1157996. ISSN 0036-8075. PMID 18635798. ^ Sheehy, Daniel E.; Schmalian, Jörg (2009-11-23). 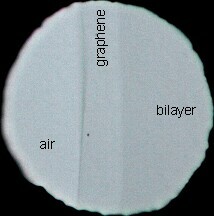 "Optical transparency of graphene as determined by the fine-structure constant". Physical Review B. 80 (19). arXiv:0906.5164. doi:10.1103/PhysRevB.80.193411. ISSN 1098-0121. ^ a b Charlier, J.-C.; Eklund, P.C. ; Zhu, J.; Ferrari, A.C. (2008). Jorio, A.; Dresselhaus and, G.; Dresselhaus, M.S., eds. 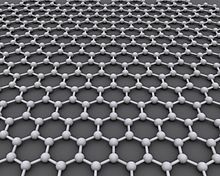 Electron and Phonon Properties of Graphene: Their Relationship with Carbon Nanotubes. Carbon Nanotubes: Advanced Topics in the Synthesis, Structure, Properties and Applications. Berlin/Heidelberg: Springer-Verlag. ^ Cao, Yuan; Fatemi, Valla; Fang, Shiang; Watanabe, Kenji; Taniguchi, Takashi; Kaxiras, Efthimios; Jarillo-Herrero, Pablo (2018-03-05). "Unconventional superconductivity in magic-angle graphene superlattices". Nature. 556 (7699): 43–50. arXiv:1803.02342. doi:10.1038/nature26160. ISSN 0028-0836. PMID 29512651.